Home / Style Ranger / Layering Gone Horribly Awry!!! Learn to layer now! Layering Gone Horribly Awry!!! Learn to layer now! All The Single Layer, All The Single Layers! Fickle weather? What to do? More importantly..what to wear?! Grab your sleeveless tank, tissue tees, tunics, v-necks, scarves, gloves and any other accessory you can think of (if you do not have any of the aforementioned articles stop by Range for a complete fall wardrobe)!!!! Now, let's take a stroll down layering lane. 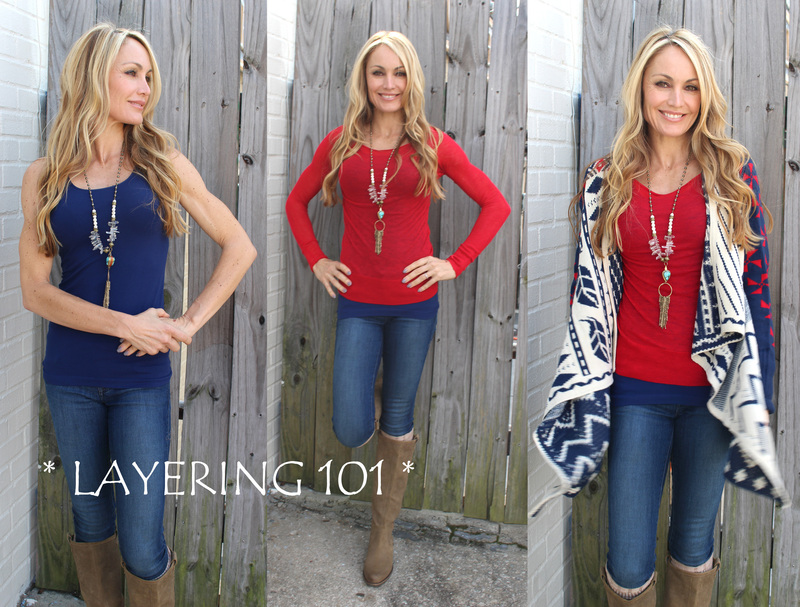 Layering is the key to maintaining style, warmth and comfort, especially for those of us who live in a southern state; however, Style Ranger be warned....if you are petite, full-figured or a layering addict, BEWARE! Less is more when it comes to the Law of Layering. Shop Range Boutique in person or online! Rule #1, Save the bulk for Costco Shopping..avoid the bulky look too many layers can bring. If you opt for a long flowey skirt, pair it with a sleeveless turtle neck and a fitted cropped blazer for added warmth. Feeling toasty? Toss the blazer and use a thin but season appropriate wrap. Try not to over-do your layering! Photo from Huffington Post. Rule #2, LENGTH matters...note, I said length. Again, petites and full-figured ladies, your extra layer needs to fall in a flattering spot. Not all are blessed with the behind that can pull off leather pants or jeggings without covering up a tad. Pairing tight sassy pants with a chunky sweater and a statement necklace will help to make the ensemble flattering and bring wondering eyes to somewhere other than you rear end. Shop at Range Boutique in person or online!